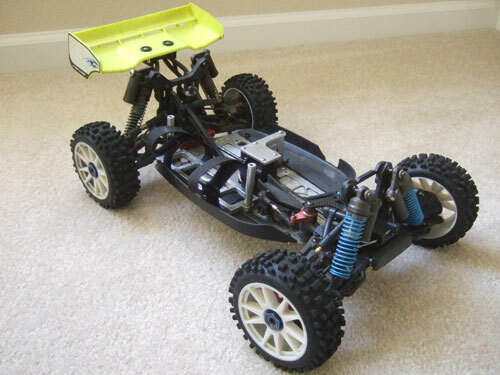 As I previously though that the Cen Matrix truggy has the same layout and the buggy. I was wrong, they are very similar but very different. For starters, the spur gear on the truggy is 66 tooth and the buggy is 46. Because of the large size difference my original motor mount design is not sitting too high and too far from the center diff. Plus center diff sits a little further back on the chassis compared to the truggy, which caused a problem for both the motor mount and battery tray. That is the main reason none of my brushless mount was plug and play. In my initial plan with the truggy was to use all the existing holes on the chassis and not drill new ones. 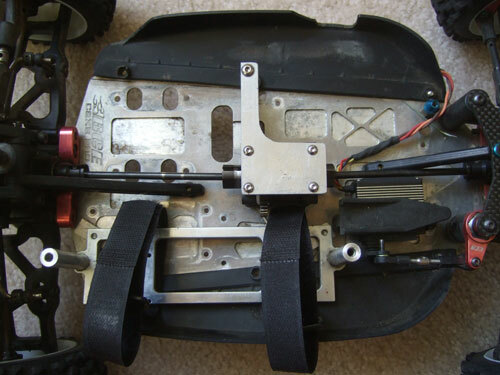 But in order to get my motor mount and battery tray to fit in the buggy, all new holes was needed. 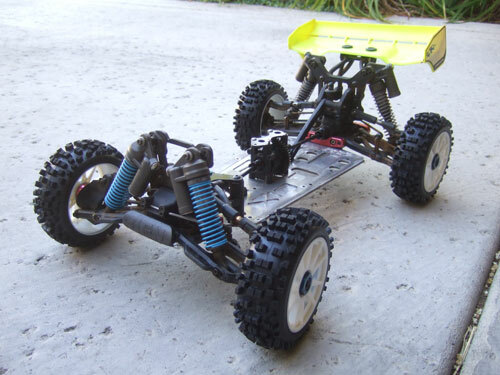 This is the stripped down version of the buggy, all ready to install the brushless conversion. 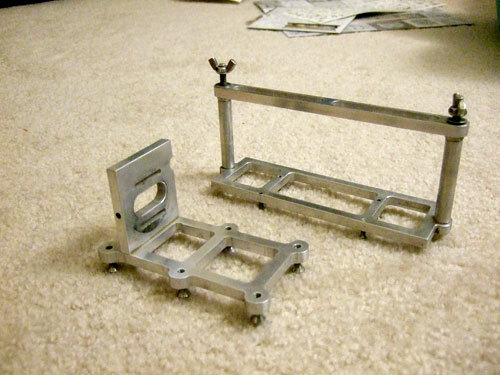 These are the original brushless conversion battery and motor mounts for the Cen Matrix Truggy. 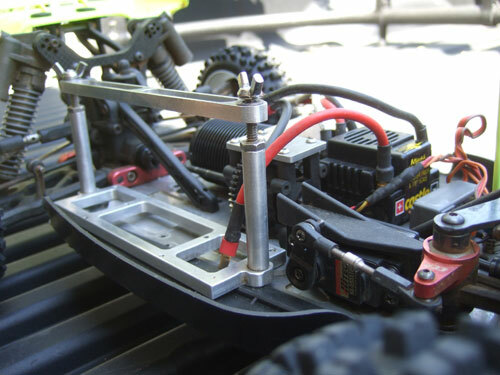 Click Here to read about my previous Cen Matrix Brushless Truggy conversion. As you can see in this picture the motor mount has changed a lot. Instead of the lower motor brace, I had to support it from the top by replacing the center differ brace with my aluminum L shaped plate. And I had to drill new holes on the bottom of the chassis to support the motor plate. 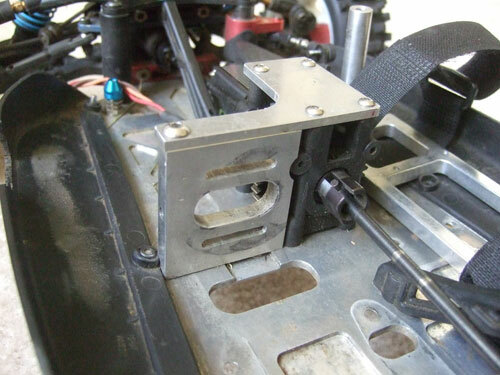 Here is the original battery tray mount with new holes I drill in the chassis. In the end this battery tray sat too high and could not get the body to fit after the battery were mounted. Because my original design was for a truggy, I had a lot of space to work with under the body. In the next picture you will see my updated design using Velcro straps which lowers the battery tray about an inch, just enough to fit everything under the body. Now the buggy is ready for a Brushless System.